What is Websockets and How it Works? It is closely associated with http as it uses http for the initial connection establishment.. The client and server connect using http and then negotiate a connection upgrade to websockets, the connection then switches from http to websockets. The client and server can now exchange full duplex binary data over the connection. Why Use MQTT over Websockets? MQTT Over Websockets vs MQTT. In the case of MQTT over Websockets the websockets connection forms an outer pipe for the MQTT protocol. 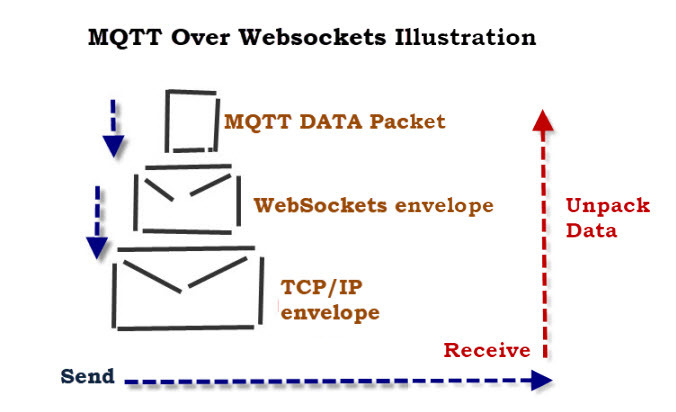 The MQTT broker places the MQTT packet into a websockets packet, and sends it to the client. The client unpacks the MQTT packet from the websockets packet and then processes it as a normal MQTT packet. With MQTT the MQTT Packet is placed directly into the TCP/IP Packet. Note: This section is left for reference. Windows install packages still don’t have websockets.Linux package installed using apt-get currently installs mosquitto version 1.4.12 and has websockets support already complied in to it. The default Mosquitto install packages for Windows and Linux do not include support for WebSockets. Compile and install your own Mosquitto broker with Websocket support. There are instructions for compiling Mosquitto with websockets here (Linux) and here (windows). There was no makefile so I had to create the build directory and run cmake. The ares.h file was missing, so I needed to install it as per instructions. I kept forgetting to run commands as sudo which meant copies failed when running make. Since mosquitto 1.5.1 websockets support has been enabled on the windows binary files. However when you start mosquitto it appears to be listening on the websocket port but doesn’t allow connections. mosquitto v 1.5.4 does work with websockets. Here is a link for the downloads. MQTT over Websockets usually uses port 9001 but it isn’t fixed. This creates an extra listener using websockets and port 9001. To test websockets you will need a client that supports websockets. When creating a new MQTT client object. You also need to set the port to the WebSocket port. (9001). Here is a Python demo script that you can use to publish and subscribe using websockets. There is no real indication that the client is using websockets as opposed to standard MQTT. To use websockets over TLS you need to configure the broker to use TLS. See this tutorial Mosquitto SSL Configuration -MQTT TLS Security. Notice The extra listener is using websockets and the ssl configuration applies to it. I also used port 8081.
test.mosquitto.org– uses port 8080 un-encrypted and 8081 for websockets over SSL. iot.eclipse.org support only encrypted and uses port 443 for websockets over SSL..
broker.hivemq.com -uses port 8000 for websockets. Websockets over SSL not supported. Q- Can You use websockets over an encrypted connection? i did consider that (for a few seconds) the nodes are at two different locations all doing the same thing. the common point is hiveMq so what you are saying is logical. i had ruled it out because i did not realise that they were unreliable. now however i have run into a problem which is outside my experience. using hiveMq with 5 esp nodes connected i suddenly stopped receiving posted messages. this can go on for a few days, then just as unexpectedly they start again, sometimes just a few before the next block, then another long wait. it is almost as though something is filling up and then stopping. Are you sure it isn’t the broker going down? The free providers are not very reliable. I’ve experienced many problems with them. I was wondering if you can help me. I have installed Mosquitto successfully in the past but for some reason stuck on a new build. Mosquitto installs correct with both MQTT and Websocket listening on 1883 and 1884 respectively. I can connect to the ports fine, however the publish messages isn’t showing up on Websocket connection. Any ideas? If you are on windows download the files from the site and use the mosquitto.exe file from the download files as it is an older version that works. I had someone the other week with a problem with SSL over websockets and it was because they had a new version of Mosquitto. Sorry but can’t remember which version. I,m trying to install MQTT in raspberry pi 3 and im getting the below error at the end. may I manage on a single istance of Mosquitto server both MQTT and WebSoket protocol so connet either a ordinary MQTT client and a browser ? is this the corret mosquitto.conf configuration ? Please disregard the my last comment. I found that the version of libssl I had was incompatible with the libwebsockets version we are using. I reverted the changes I made to ssl.c. I removed libssl-dev and installed libssl1.0-dev using apt-get. Then I did a clean build of both libwebsockets and mosquitto. Both built without error. If you just comment out the two offending lines in /c/libwebsockets-1.4-chrome43-firefox-36/lib/ssl.c it should build ok. The function call causing the error has been deprecated. It does nothing and can safely be removed. pi@raspberrypi:/c/libwebsockets-1.4-chrome43-firefox-36/build $ sudo cmake -DLWS_IPV6=OFF .. Sorry but I’m not an expert on compiling c files. I have only done it once recently and that was to get websockets working. I had to take each error message and resolve it by doing an internet search. It seems like yours failed early with git I would try and resolve that first and work your way through it. is there any simple way of making mosquitto broker on raspberry pi run websockets? I assume you mean without having to compile it. As far a I know there isn’t a package available with websockets that you can install via the package manager. I would assume that if you got a copy of the binary it would complain about missing files. I can send you the binary for you to try.If I get a chance I will setup another Linux box and try it myself. i tried to solve the problem but nathing arrived. !!! Thank you for the whole information, i also develop a sytem which has multiplatform works on android, web, windows desktop. Each platform uses mqtt and works greate, for sample usage i added to my website , so you can see the efficiency of system, when you write message from this site http://oguzsoft.com/oguzchat , i will be answer from my android phone. Thanks again. Please help me , how can i fix it..? Sorry but I don’t use Visual studio but it sound like the cmake compiler cannot find your compiler. This could simple be a path error. then How can I run my own code on browser? I played around with this when I was looking at web sockets. If you want I can upload a working html page that does basic connect,publish and subscribe that you can use a a start. It will probably take a few days to sort it out. Just let me know.